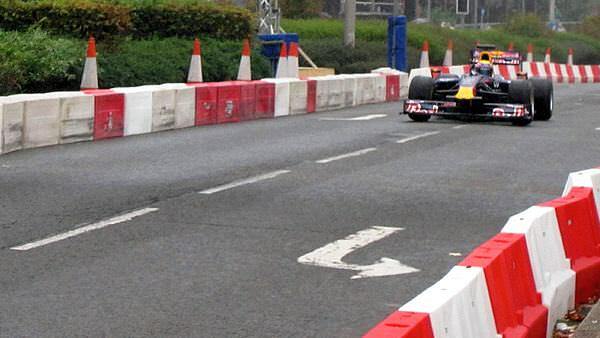 Fresh from their efforts to bring F1 closer to the fans in Texas, Red Bull turned their attention to Cardiff yesterday, wowing the crowds with their Speed Jam event. 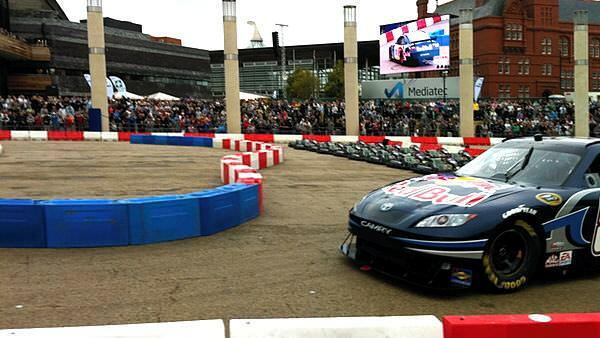 Held at Cardiff Bay, the fans certainly turned out to see Mark Webber and Daniel Ricciardo take to the streets. With F1, NASCAR, Karting and stunt planes all in attendance, there was no shortage of things to see and do in Cardiff Bay. James and Lukeh were both in attendance yesterday, capturing the event with pictures and words, which they were kind enough to send to us. Here's how Red Bull's Speed Jam went. I've just woken up after a fantastic day in Cardiff at the Red Bull Speed Jam. For someone who can't really afford to go to a Grand Prix, it was a fantastic opportunity to get up close with a couple of names from the F1 world. 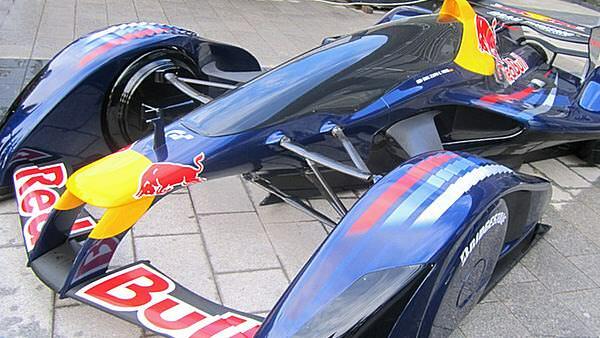 Mark Webber, Jake Humphrey and Daniel Ricciardo were all there. Jake was on duty as host, Daniel completed a demo in a NASCAR (I didn't realise how noisy one of those things was) and Mark took an F1 car to the streets of Cardiff Bay. On top of this, you also had the Red Bull Matadors (stunt planes) taking to the sky, Chris Pfeiffer doing a stunt bike display and, of course, the main reason for Red Bull being in Cardiff - the Kart Fight. That definitely supplied the crowd with some 'thrills and spills'. 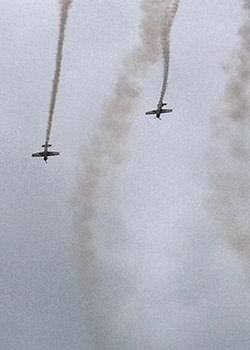 It was a great day out and Red Bull put on a entertaining show. Even my wife got a bit more interested in F1, although I think the main reason for that was she got to meet Jake Humphrey!! My only disappointment was that my favourite driver Sebastian Vettel wasn't there, but I can't really complain after a great (free) day out. The old cliché with things like the Red Bull Speed Jam is that these kind of events are good for the sport, good for public awareness and good to share with many who elsewise wouldn't get access to things like Formula 1. Having attended the Speed Jam yesterday, it would be impossible to disagree with this because the whole event managed to be a wonderful way to not only get thousands closer to something like F1, but also allow this audience to gain an insight into the world of karting. The Speed Jam consisted of a few events - a tournament of karting races leading into a grand final, show runs courtesy of Mark Webber in the Red Bull F1 car and Daniel Ricciardo in the Red Bull NASCAR, Chris Pfieffer being completely mental on his bike and the Red Bull Matador planes showing their skills - and every single moment was worth attending for. The surprise highlight for myself was the karting, in which the races involved turned out to be chaotic, exciting and utterly compelling viewing, around the slippery streets of Cardiff on an overcast and at times wet day. Their races involved crashes, spills and fantastic moments of overtaking, plus battles for the win in pretty much every race we saw. It's also worth mentioning how many times I heard people standing around me commenting on just how good the karting was - pleasing to say the least. For many though, it was the sight of seeing Mark Webber storm down these thin streets alongside Cardiff Bay with his V8 engine screaming away and that sight, as utterly surreal to someone like myself who has a good knowledge of Cardiff, was just absolutely awesome. The sight, the sound, the smell - just awesome. And even though I'm no NASCAR fan, that car was an absolute beast to witness too - Ricciardo doing donuts in what can only be described as a magic trick (he completely disappeared it was so smoky!) made for incredible viewing. On the whole, the day was a huge success for spreading the word of motorsport in its many wonderful forms. Even if fans came along just to see F1 in South Wales, they got treated with some incredible karting races, some stunning tricks from Chris Pfieffer, the deafening declaration of the NASCAR engine and the Red Bull Matador planes too. I can only hope that Red Bull bring back the Speed Jam next year because it was a huge success, a fantastic day out for all involved, and just a perfect way to spend a day in the Welsh capital. Although I think Mark Webber certainly learnt a lesson based on the crowd's response on how not to confuse Wales with England!